Ease down a tidal estuary and watch the rich hues of sunset fall over Westport Harbor. Experience nature’s transition from day to dusk. This leisurely paddle into the Westport Harbor takes advantage of the dimming light, diminishing winds, and rich sunset hues. 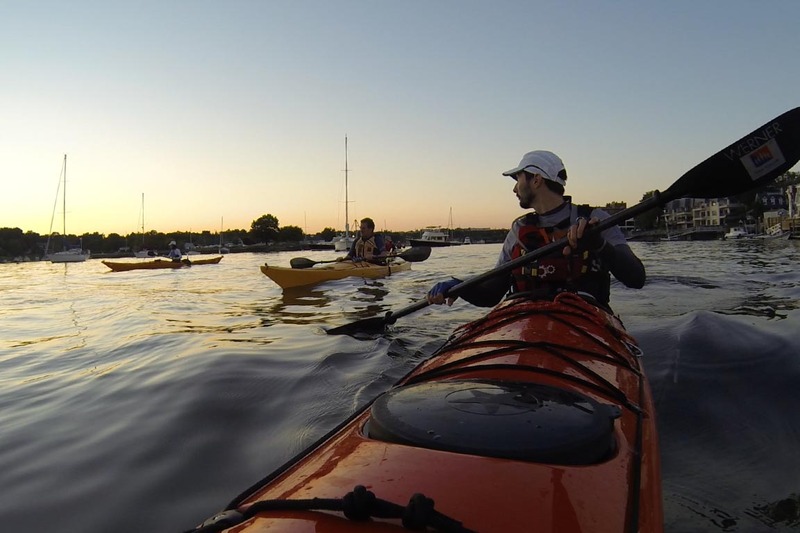 This evening guided tour explores the protected waters of a tidal estuary and meanders through the mooring fields in Westport Harbor. It is suitable for beginner paddlers. – It is recommended that clients arrive 30 minutes early to complete paperwork; get properly fitted for paddles, kayaks, and life jackets; and pack essentials in boats. – Our single-person sit-on-top kayaks are sized to each paddler, comfortable, stable, and suitable for paddlers of all skill levels. The following items have been put together to help ensure that your paddling experience with us is comfortable safe and enjoyable. All items are required. Please make sure you have these items well in advance of your scheduled lesson or tour. •Waterproof storage bag or box for keys, phone, camera etc. 1. HEADING SOUTH ON I-95, TAKE EXIT 17 and turn right onto Saugatuck Avenue. Take the first left onto Charles Street. 2. At the end of Charles Street, turn left onto Riverside Ave.
3. Drive .2 miles and turn right onto Bridge Street. 4. Drive .5 miles and turn right onto Compo Road S.
5. Take the first right onto Elaine Road. 6. Entrance to the parking lot and launch will be up on the left just before the I-95 overpass. Reservations are required for all programs and may be made online or over the phone. Payment is due in full at the time of the reservation. We accept all major credit cards. Cancellations with 48 hours or more notice before the program start time will receive a full refund. Cancellations with less than 48 hours notice will result in forfeiture of the entire program fee. 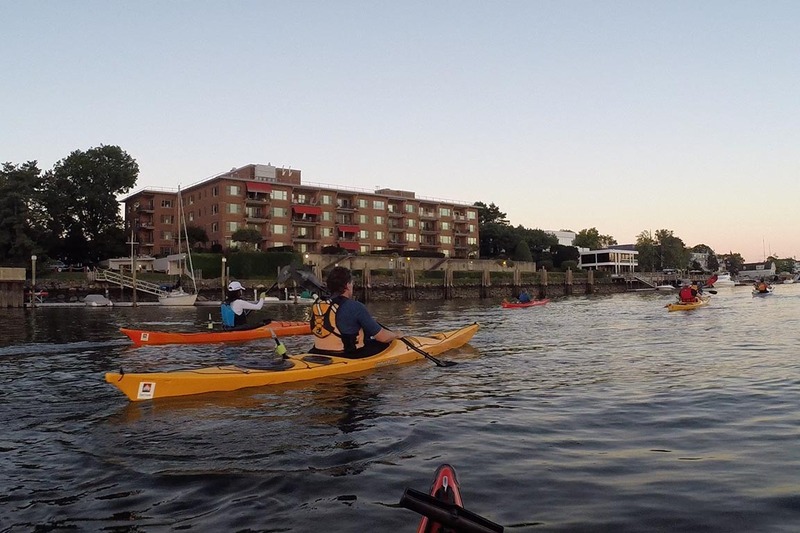 In the event that Sea Kayak Connecticut cancels a class or a tour due to lack of minimum enrollment, severe weather, or an emergency, clients may opt to reschedule their program or receive a full refund. All scheduled programs will run rain or shine. A few sprinkles won’t keep us off the water, so please pack a light rain jacket if showers are in the forecast. 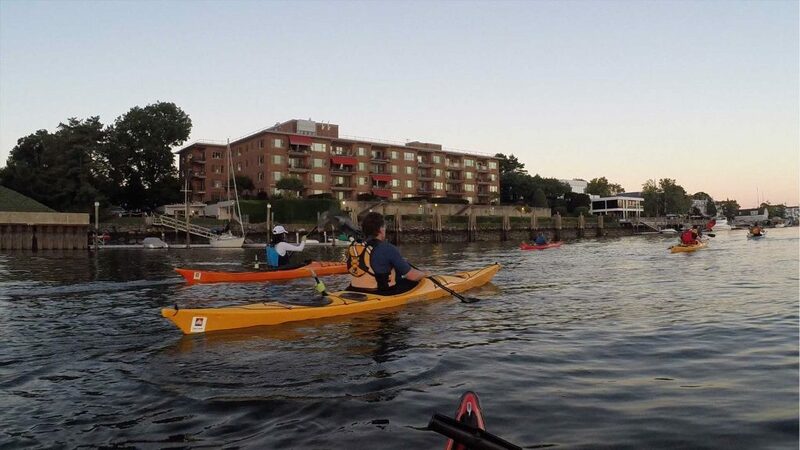 Should Sea Kayak Connecticut determine that the weather conditions are unsuitable for an upcoming program; we will cancel the class/tour and contact you via e-mail, text or by phone. In the event of anticipated rainy or windy conditions, our guides will make an at-the-launch decision as to whether or not to launch. Please plan on attending your program regardless of the weather in your immediate area or the forecast at the launch site. For All Outdoor Programs you may either bring your own equipment or we’ll supply it for you at no additional charge. We do not provide discounts for bringing your own equipment. 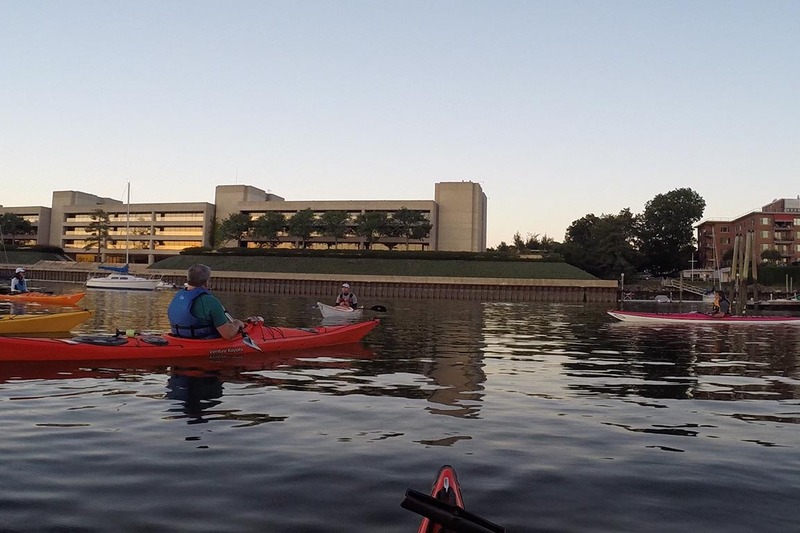 Clients may bring their own sea kayaks provided they are sea worthy, at least fourteen feet in length, have bulkheads fore and aft, sealed hatches, and perimeter deck lines. 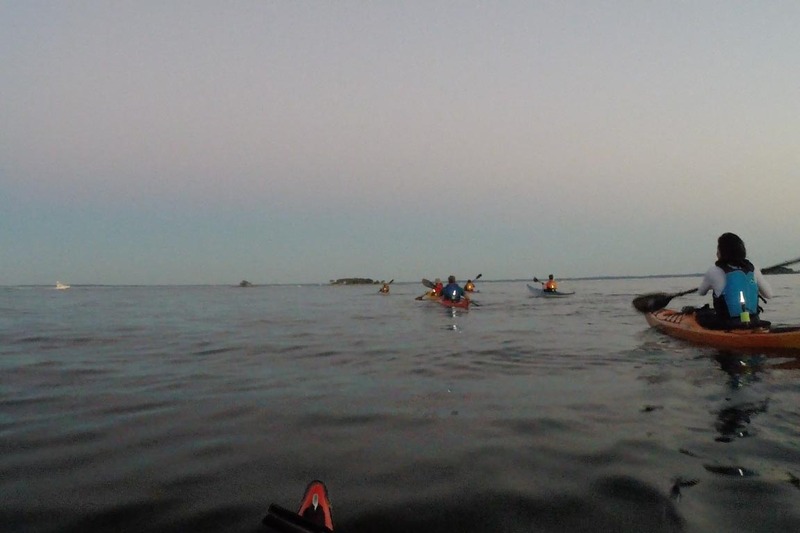 For sit-on-top programs, clients may bring their own sit-on-top kayaks provided they are sea worthy. Please contact us if you are unsure as to whether or not your equipment is suitable for one of our programs. Breathable life jackets will be provided and must be worn by all participants. Forms including liability release forms and a confidential medical questionnaire are required for each program from each participant. Please complete all paperwork prior to arriving for your class or tour. 12 Years Old is the minimum age requirement for participating in classes and tours. 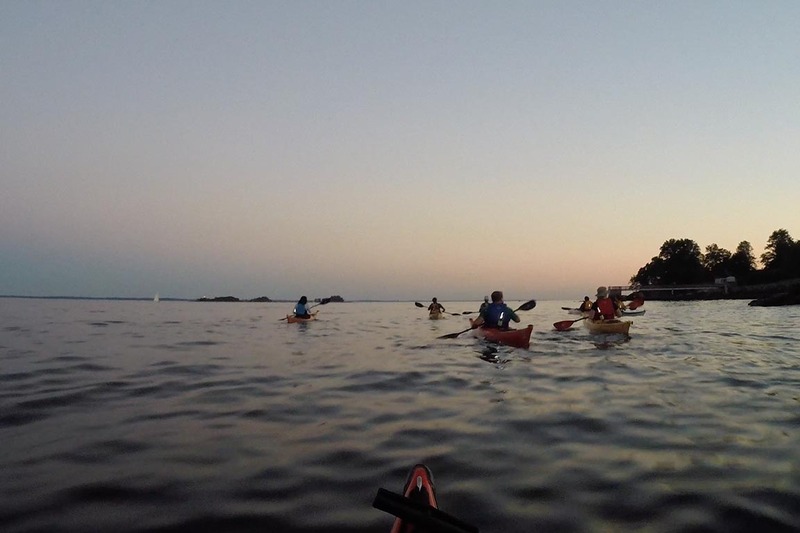 Please also note that we only provide singleperson kayaks for our tours and classes. Paddle-specific clothing is highly recommended for all programs. Essentially, dress as if you are going swimming. We’ll do our best to keep you high and dry but wearing the right clothes will make for a much safer and far more enjoyable paddling experience. Wearing synthetic shirts and shorts, a ball cap and pair of shoes that can get wet will make for a comfortable day out on the water. Personal Info is asked of you so that we may properly fit you to your kayak, paddleboard, paddle, life jacket and spray skirt. 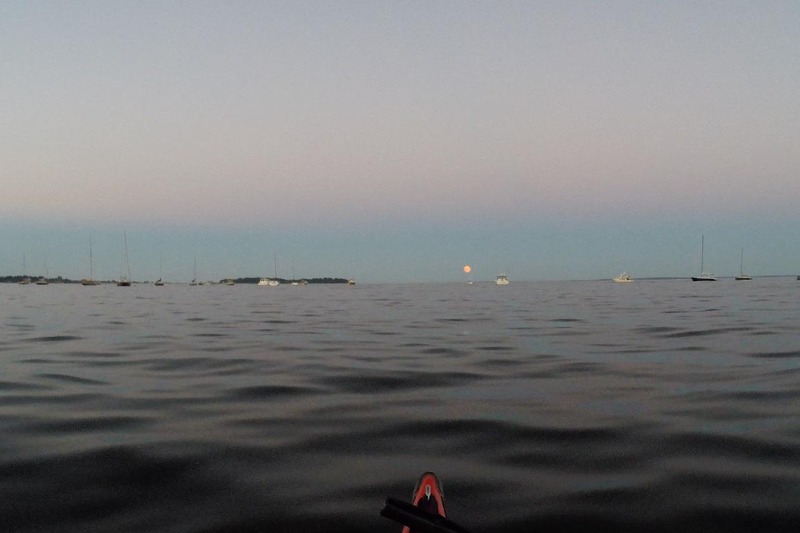 Punctuality and Preparedness are two hallmarks of Sea Kayak Connecticut. To ensure that everyone gets to enjoy every minute of the scheduled program, it is very important that clients arrive on time. Please arrive having everything on the Paddlers Checklist completed and in-hand 30 minutes prior to the program start time.